The subject line was just an unimpressed emoji face, which is not really what you’re looking for in email communications with clients. Reader, I don’t mind telling you it was with a dry mouth and shaking hands that I clicked through to look at her website. Was I a fraud? Was I about to get my first request for a refund? WAS I A FAILURE AS A HUMAN??? Instead of discovering that I was an impostor who should never be hired by anyone again ever, I discovered that my client had ignored 85% of the suggestions I’d given her. Had she fixed any of those broken links? No. Was she using headings to make her blog posts more readable? Nope. Did she optimize her posts? She did not. Unsurprisingly, my initial reaction was to draft a not-entirely-polite email to this client who’d spent a lot of money to ignore my advice. But then I realized that I was just as much at fault for this as she was. I hadn’t told my client why she needed make these changes. It’s hard to get excited about embedding code, scheduling Facebook updates, or re-jiggering old blog posts if we don’t understand how + why it’ll benefit us. Dur, right? But it’s so easy to forget! And there are tons of (somewhat) valid reasons we forget the why. Maybe we’ve been doing something for so long we can’t even remember the beginner’s mindset. We don’t remember what it’s like to struggle with SEO/white balance/classroom management. It’s been years since we learned about alt text, so we forget to even explain it. Every time we explain things before our clients have to ask, we’re strengthening our relationship and building trust. We’re showing them that we know how to make things easy and clear for them. We’re demonstrating they can depend on us to be helpful and to anticipate their needs and concerns. In all of my courses, I include ‘Where you might get stuck’ sections, slides and exercises where I address the stumbling blocks I know my students are going to come up against. I know some of my Habit School students are going to struggle with choosing which habit to change first. I know some of my Put Your Money Where Your Happy Is students will be afraid of renegotiating bills and fees. Because I know this, I can address those concerns before they give up. If my site designer simply tucks an image next the newsletter signup bar under my header, I might not even notice. I asked my Money & Happy Facebook group to share the purchase/activity/experience that brought them the most joy in the last week. There are three reasons it’s important to share this stuff. 1. We get a significant portion of our happiness from recalling the things that made us happy. So when we devote a few seconds remembering that perfect dinner party or how we finally saved enough to purchase our Dream Jeans, we’re increasing the amount of happiness we experience from something. 2. When we articulate what makes us happy – to either ourselves or others – we’re strengthening neural pathways and making it easier to do those happy-making things again in the future. We’re making it more likely that next month, when we’re feeling down, we’ll remember that re-reading Harry Potter is a major joy-increaser. When you’ve ghostwritten hundreds of articles, it’s easy to believe that every one knows and understands what goes into a blog post. The same goes for website design, styling a photo shoot, coordinating an event, etc. But our clients don’t know and they won’t know unless we tell them. So find a way to diplomatically, professionally give them a bit of insight into everything that goes into the work you’re doing for them. Back when I was ghostwriting blog posts for clients, I’d include comments in our shared Google docs about why I was doing what I was doing. I explained why I wrote titles the way I did and shared the Co-Schedule Headline Analyzer rating for the title. I pointed out that I used sentences and paragraphs of a specific length because that increased readability. I told clients that I worked their SEO keywords into an anecdote-based intro because it made their posts more Google-able and more likely to draw readers in. After all this, my clients always thought $250 for a blog post was a basement bargain! If I don’t take the time to tell my client why they should change their Facebook header photo or use shorter sentences, it’s very likely they’ll email me for clarification. This could easily set off a string of emails that will eat up precious time that could be devoted to more important, more fun things. (Read: teaching the cat to fetch.) Spend the five minutes up front explaining your suggestions and save you 20 minutes and five emails later. I told a client that even though she had the stock standard ‘pin it’ button on her blog posts, she should install the J. Query plugin. 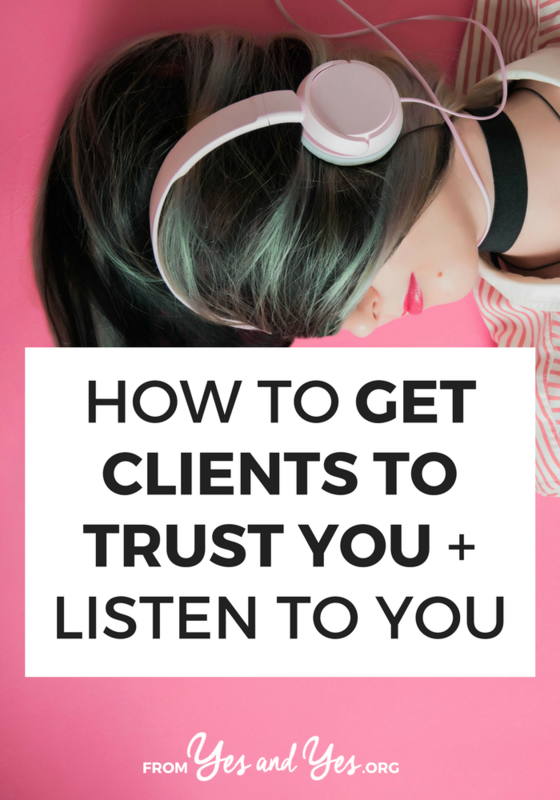 Getting clients to trust you, listen to you, and then actually take your advice makes for happier clients, better results, and more business in the long run. And it can be as easy as adding a few explanatory sentences to a follow up email! I want to hear from you! Do you ever struggle to get your clients to listen to you and take action? If you do, how do you deal with that? Tell us in the comments so we can learn from you! A lot of this applies to healthcare and motivating clients in rehab (pt/ot/speech)!! Ooh, I definitely needed this right now! With a suddenly increased workload, I’ve been juggling clients and just churning out work as fast as I can to keep up. You’re reminding me to show my work a little more, give additional helpful information, and showcase why they hired me in the first place. Thank you, Sarah!! I love your decision to move your business articles to yesandyes! I am not in the blog/social media world so I didn’t read your previous business site but this article is applicable to anybody who maintains client relationships! Buy in from your clients is so important and this article gives me some really good examples I can apply to my day-to-day.